On this week's Outlander, Claire proves her skills as a healer, but it does not have the intended effect. Also, she meets the fire-and-brimstone, mysogynistic Father Baine; Geillis becomes more enigmatic; and Claire teams up with Jamie for some ear-saving and plant-investigating. The title shot says it all! Claire plans to use her time trapped in the surgery of Castle Leoch to win Colum's trust and respect as a healer, thereby earning her way out - of Castle Leoch, of 1743, of her lonely predicament. Does she succeed? Well...yes and no. Before we proceed: A moment to reflect on the beauty of this series. The cinematography, the costumes, the props, the Scottish scenery...it's so gorgeous. Every shot is beautifully framed and each set or location is sumptuously detailed. Even simple things like this shot of Claire looking out the window, they make interesting. I just love it. Claire applies herself with gusto to her new role as castle healer, believing that in this way, she will gain her freedom. She seems to adjust reasonably well to using 18th century herbs and plants to treat patients. 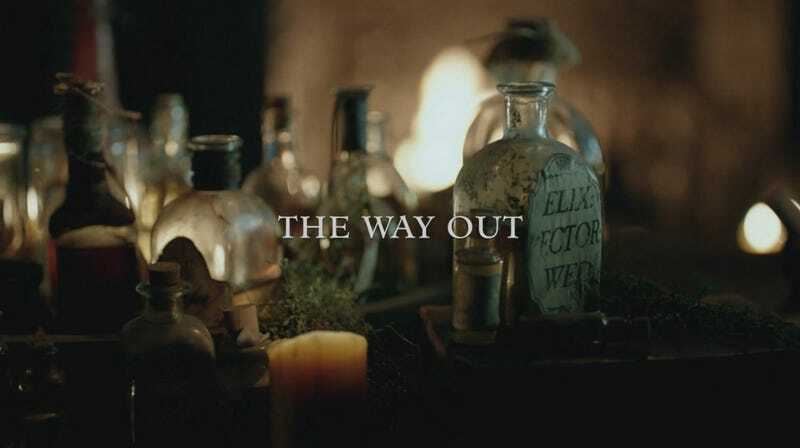 Claire's first clash with 18th century medicine has nothing to do with medical supplies, but rather with the superstition and medical ignorance of the residents she must treat. When a couple of boys in the village get "possessed," Claire seems determined, beyond just a desire to prove herself to her captors, to find an "earthly" explanation for their illness. In the process, Claire meets the illustrious Father Baine, a pure delight of a man, who oozes charm and charisma out of his very pores. Naturally, Claire's treatment works, and rescues the boy from certain death (much to the chagrin of Father Baine). Unfortunately for Claire, her success becomes renowned - she is called the "miracle worker" - and Colum is not likely to give up his prized healer. Though she accomplished her goal of proving herself an able healer, she did too good of a job, and it seems she is more trapped than before. Claire in her loneliness is latching on to any friendly company she can find. One such friend is Geillis Duncan, she of the red shoes and feminine wiles. The other person Claire doesn't mind spending time with is Jamie, our resident horse-tamer. Still, she and Jamie recover and seem to get along well. The next day, he helps her 3 times in a row - first, saving her from the inquiring mind of Geillis Duncan; second, sharing in her scheme to save the tanner's lad from certain mutilation; and third, taking her to the Black Kirk where the boys from the village supposedly became possessed. From the beginning, this episode has an undercurrent of examining gender roles. Claire is sent to nurse soldiers at the front lines, not Frank; Father Baine thinks he is above all women, even after Claire succeeds where he fails; Geillis, though not in an overt position of power, is able to bend her husband to her will. Can our 20th century woman fit into this 18th century moral landscape? How does a woman exercise strength and power in this time? Claire's approach is more headstrong and confrontational; Geillis is more wily. Which is better? More effective? This week, Claire's plan backfired. Next week, we'll see if her renewed hope drives her to develop a new strategy to get back to the stones. A few times in this episode, the devil is referred to as "Old Nick" (or "Auld Nick"). Some quick research shows that the origin of this term for Satan is a bit vague, though it did appear in the poem "Tam o' Shanter" by Robert Burns, written in 1790, and is believed have been in common use in the 1600s before that.